Endoline can supply either a customer specific designed manual packing station, or a fully automatic pick and place solution. Each system is specifically designed to suit the application, product weight, budget, and speed requirements. With both low and high speed solutions available, Endoline have the flexibility to combine any of its case erecting or case sealing machinery with a case loading system to offer customers a fully integrated service. A fully automatic case loading system requires no manual operation. The technology available can include articulated robot arms and Cartesian systems, giving customers the widest choice of technology through one source. This machine range is ideal for the packing of many products including household goods, ready meals, biscuits, snacks, tea, coffee and fresh and frozen goods. Labour intensive case packing operations are often a cause of repetitive strain injuries. Endoline’s manual packing stations are specifically designed to be compact, easy to use and ergonomically friendly. These systems are designed to reduce the effort to hand pack a variety of products and investing in a manual packing station offers a very quick a return on investment. Each system can also be integrated with any Endoline case erecting or sealing machine. Case loading systems have many advantages such as quality control, flexibility and high efficiency. These systems are designed to improve the process of loading products into cases, helping customers increase speeds and reduce costs. A case loading application will also offer customers complete flexibility by installing a fully integrated case packing line. Endoline design case loading systems to specific applications as diverse as snack bags, flow wrapped confectionery, tubs of pet food and bottles of liquid. High quality components housed in a robust chassis ensure minimal servicing for 24 hour operation. These systems are designed for the rigours of typical end-of-line packaging environments. Endoline work with a number of industry leading manufacturers of robotic systems to provide the best solution. Endoline will provide a fully integrated packing line ensuring all elements work together to optimise production. 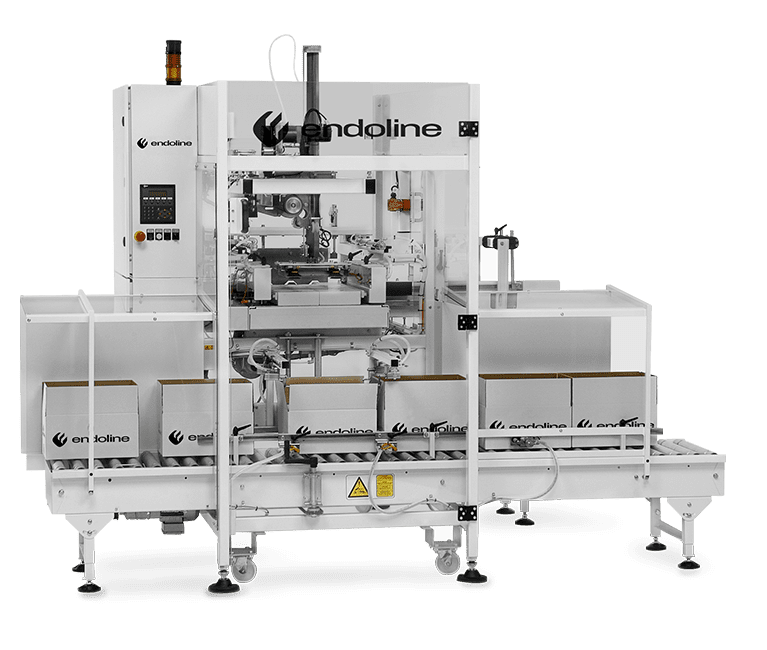 Endoline case packing lines are designed to give you the best possible value for your investment through maximum productivity with minimal stoppage time. All Endoline’s machines are built for 24/7 operation and require little maintenance offering a long life expectancy resulting in a low cost of ownership.